Not the movie. And probably apropos of nothing, but for the last 5 years I’ve been dying to stay in one of the treehouses in Oregon. They’re not really expensive and it’s taking camping to a new level plus some of them are even B&Bs (maybe my next business venture?). Imagine my surprise when last week, our good friends over at trendcentral posted an entire newsletter about treehouses around the world. Who knew that I could stay in one of these just about anywhere?! 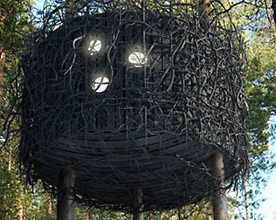 Of course, I immediately wanted to book a trip to the one that looks just like a nest. But, it also got my event planning chops working and I wondered if there was a way to incorporate this idea into some upcoming client event. Sure, I’ve seen plenty of Martha Stewart weddings with bird’s nests as centerpieces, but could one of my clients embrace the treehouse/birdhouse? My answer is yes, but I just have to figure out how. Maybe it’s a good fit for introducing a new outdoor feature (anyone fancy an all treehouse themed event?) or maybe it works when we’re talking about back-to-basics or maybe it was just a great way for me to get out of my “the newest is the best” or “retro is back rut” and think about different ways to incorporate new ideas into my pitches. Or maybe, I should just book myself a treehouse getaway and get it out of my system. Event planners, how would you use this concept at your next event? I’m about to take a little work/ blogging hiatus to work on my own personal big event. Steam Bug Travel Steam Iron: I think I have to have one of these. The personal and event uses are endless. How many times have you showed up at an event and either the table cloths or your guest of honor could use a little less wrinkling? At just $35, I think this just may have become my new travel must-have. It heats up in 15 seconds, has three settings , one touch steam and a travel pouch. This totally looks like something I would find in an in-flight magazine. However, as a true believer in the power of in-home sun lamps (having moved to the Pacific NW from Colorado 10 years ago, I definitely need my fix of sun), I think this is a perfect accessory for time on the road and would definitely help me adjust to new time zones or 4AM event wake ups. Speaking of changing time zones, I often struggle when I travel internationally for an event and am immediately required to be in a new time zone hours from my home. The Sleeptracker monitors all five stages of your sleep and helps you avoid waking up at the wrong moment, the one where you’re haggard and slow. Instead, it gently wakes you when you’re most alert os you feel refreshed instead of groggy. Maybe I need one of these in my everyday life too!? Every time I leave on a business trip, I strive to take the least amount possible so I don’t have to check my bag. Inevitably, I end up walking through the airport juggling my rollerbag, laptop bag, purse, coffee, snacks, books, etc. I’m loving this little gadget that provides my coffee a non-spill spot to rest as I run to the next gate for my connection. Sadly, I didn’t register for any of these items so looks like I’ll have to save up my AMEX points to get some new travel helpers. Any gadgets that help make your trips a bit easier?